It’s no secret that storage technologies have taken a giant step forward over the past several years. SSD and NVMe are coming more and more to the fore, which opens up new possibilities for businesses. Given that enterprises run their workloads over distributed infrastructures, this also immediately triggered the development of new storage transport protocols. One of this protocols is iSCSI Extensions for RDMA, or simply iSER. Nowadays, iSCSI technology cannot provide the sufficient level of shared storage performance. Especially, when it comes to fast flash and super-fast NVMe drives. All the applications that use iSCSI over TCP are processed by the CPU, so the data paths for iSCSI, as well as TCP, UDP, and NFS protocols, all must wait in line with other applications and system processes for their turn. This chokes up the network, and the system suffers from data-copy-overhead that causes latency issues, and as a result, poor performance. The use of iSCSI also ends up in high CPU utilization. In HyperConverged platforms, so this problem becomes even more acute, since all the compute resources are shared between the applications and the infrastructure. With the Per Core Licensing model in mind, building such system won’t come cheap. Finally, it leads to low ROI and high OpEx. iSER has been specially designed to improve iSCSI by taking the advantage of the RDMA protocol suite. Now, it presents higher performance and the lowest latency through eliminating TCP/IP processing overhead and bypassing the CPU of the target system entirely. In addition, iSER doesn’t change the existing storage allocation and consumption methods since both iSCSI management and architecture remain the same. StarWind has added iSER support with the latest trends in the storage industry. StarWind iSER supplies higher bandwidth for block storage transfers by leveraging all the features of RDMA protocol. As the result, it shows the extreme performance in the clustered systems. Therefore, such tasks as VM migration or data and VM replication become faster and easier to perform. Moreover, iSER keeps the existing iSCSI management instruments and maintains such advantages of the protocol as chap, access lists, multipathing, and high availability. This allows configuring a high-performing and redundant system. Finally, it significantly unloads the CPU. This means that now more CPU power is available to your applications and less CPU cores are needed for a high-performance compute platform. 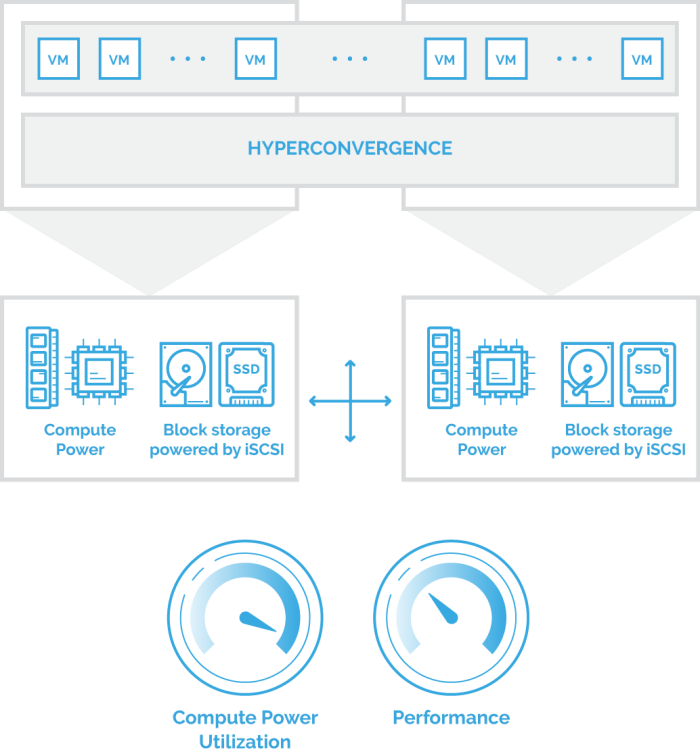 This is crucial for hyperconverged infrastructures, where applications, storage, and data services have to share the CPU power. With the support of iSER, StarWind ensures high performance for your applications. At the same time, it guarantees effective usage of the system resources resulting in much lower TCO. On top of that, it fully utilizes flash and NVMe storage capabilities, improving your ROI.